ACE, also known as kininase II, is a bivalent dipeptidyl carboxyl zinc metalloproteinase that catalyzes the conversion of angiotensin I to the potent vasoconstrictor, angiotensin II. Most of the vascular effects of angiotensin II are mediated by way of its binding to the angiotensin II type 1 receptor, which is located primarily in the vascular smooth muscle cells, heart, kidney, and adrenal gland. 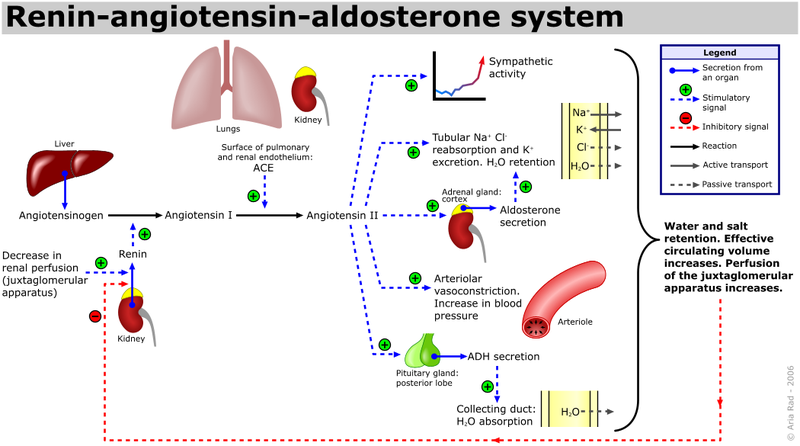 Some angiotensin II binds to the angiotensin II type 2 receptor and may help counteract some of the undesirable effects mediated through its binding to the type 1 receptor. Importantly, ACE also cleaves the C-terminal dipeptide of bradykinin, resulting in inactive peptides. Most of the effects of bradykinin are mediated through the endothelial B2 kinin receptor. In addition, ACE has other potential substrates, including tachykinins, neurotensin substance P, and others. Most ACE is located in the vascular endothelium (expressed in endothelial cells) and the adventitia of the vessel wall. Main signaling pathways of the AT2R. Activation of the receptor leads to three pathways: activation of serine/threonine phosphatases (1); activation of phospholipase A2 (2); and activation of the bradykinin/NO/cGMP pathway (3). 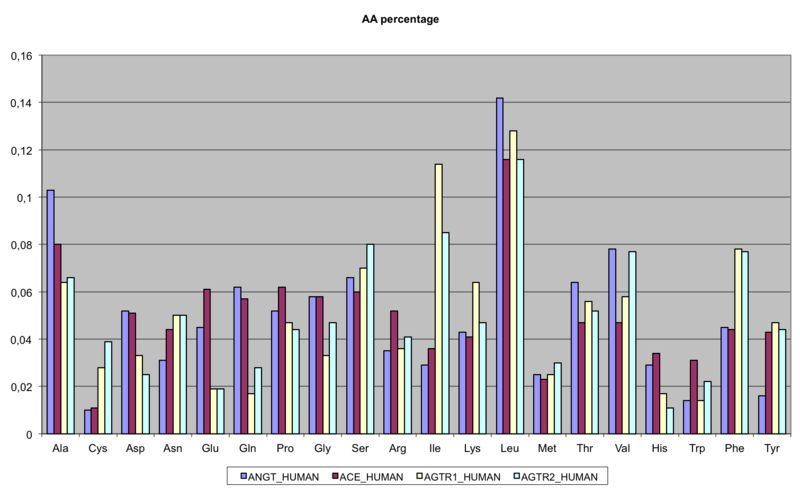 AA: arachidonic acid; Ang II: angiotensin II; AT2R: angiotensin receptor type 2; B2R: bradykinin receptor B2; cGMP: cyclic guanosine monophosphate; eNOS: endothelial nitric oxide synthase; ERK1/2: extracellular-regulated kinase 1 and 2; GTP: guanosine triphosphate; MKP-1: MAP kinase phosphatase; NO: nitric oxide; PKA: protein kinase A; PLA2: phospholipase A2; PP2: protein phosphatase 2; sGC: soluble guanylate cyclase; SHP-1: SH2 domain-containing tyrosine phosphatase. Promotion of natriuresis via activation of the AT2R by Ang III. Ang II does not promote natriuresis until it has been converted to Ang III by APA. Ang III is then converted by APN to Ang IV, which does not trigger natriuresis. APA can be inhibited by PC-18 and APN by EC-33. 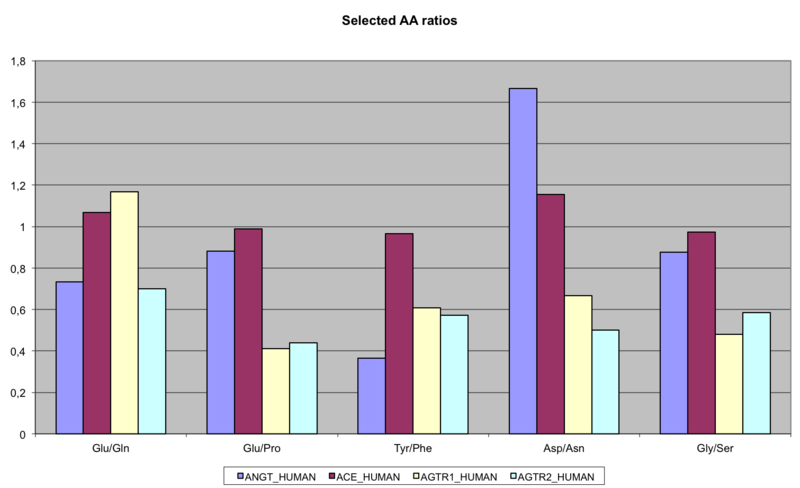 AT2R: angiotensin receptor type 2; Ang II: angiotensin II; Ang III: angiotensin III; Ang IV: angiotensin IV; APA: aminopeptidase A; APN: aminopeptidase N.